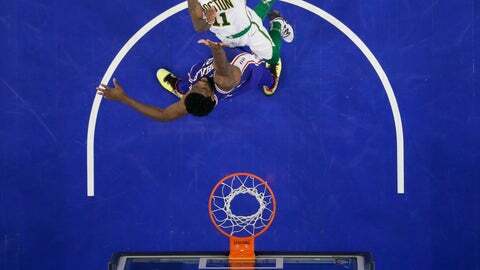 PHILADELPHIA (AP) — Joel Embiid had 37 points, 22 rebounds and a key block on Kyrie Irving with 35 seconds remaining, and Jimmy Butler scored 15 of his 22 points in the fourth quarter to lead the 76ers over the Boston Celtics for their sixth straight victory. MEMPHIS, Tenn. — James Harden scored 57 points but the Memphis Grizzlies outlasted Houston, handing the Rockets only their second loss in the last 14 games. SAN ANTONIO (AP) — Goran Dragic had 22 points and the Miami Heat snapped the Spurs‘ nine-game winning streak, sending Dwyane Wade home a winner in his final game in San Antonio. CLEVELAND (AP) — Rookie Collin Sexton scored 25 points, Jordan Clarkson added 23 and the Cavaliers delayed Milwaukee from clinching the Central Division with a win over the bruised Bucks, who were without superstar Giannis Antetokounmpo. Sexton became the only rookie in team history to score at least 23 points in seven straight games. Austin Carr (1972) did it six times. Sexton also became the first NBA rookie to score 23 points in seven straight games since Tim Duncan. Cleveland’s Kevin Love, who missed Monday’s game in Detroit with a sore lower back, left in the third quarter with an apparent head injury. ORLANDO, Fla. (AP) — Evan Fournier scored 22 points and Aaron Gordon added 20 and the Magic routed the New Orleans Pelicans. Stanley Johnson led the Pelicans with 18 points. New Orleans’ Elfrid Payton had his streak of triple-doubles end at five straight games. He finished with seven points, two assists and three rebounds. The only other NBA players with a triple-double in five straight games are Russell Westbrook (four times), Oscar Robertson (three), Wilt Chamberlain (two) and Michael Jordan (one). NEW YORK (AP) — Donovan Mitchell scored 30 points, Rudy Gobert made all seven shots and added 18 points, and the Utah Jazz romped to their fifth straight lopsided victory by beating the Knicks. CHICAGO (AP) — Lauri Markkanen had 32 points and 13 rebounds, Kris Dunn scored a season-high 26 — including eight in overtime — to go with 13 assists, and the short-handed Bulls beat the fading Washington Wizards. PORTLAND, Ore. (AP) — Damian Lillard had 33 points and 12 assists to lead the Trail Blazers past the Dallas Mavericks. OKLAHOMA CITY (AP) — Pascal Siakam had 33 points and 13 rebounds, Fred VanVleet added 23 points and six assists and the Toronto Raptors won the first of two games in three days against Oklahoma City, blowing a 20-point lead in the second half before beating the Thunder. Atlantic Division-leading Toronto snapped a four-game losing streak against Oklahoma City despite the absence of starting guard Kyle Lowry, who sat out with a sprained right ankle sustained Monday in a win over the New York Knicks. The Raptors did so with balanced scoring, good ball movement — four players had six assists — and strong shooting, making 51.7 percent overall and 38.9 percent from 3-point range (14 of 36). Kawhi Leonard added 22 points and 10 rebounds, while Danny Green scored 17. In his return after a one-game suspension for accumulating too many technical fouls, Russell Westbrook had 42 points, 11 rebounds and six assists for Oklahoma City, which has lost four straight games and 10 of 14.